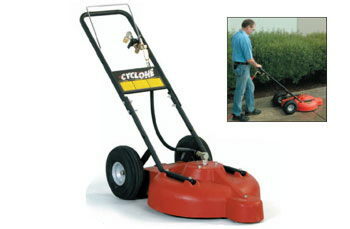 The Cyclone attaches to a hot or cold water pressure washer (minimum 3000 psi) and cleans flat surfaces fast. Spray bar spins at 2000 rpm for a 20" wide cleaning path on floors, patios and walkways. * Please call us for any questions on our cyclone surface cleaner 22 inch 3000psi rentals in Portland OR, Gresham OR, Milwaukee OR, and surrounding metro area.